Taking aim at one of Boston’s most vexing problems, the Walsh administration is planning to crack down on parking violations, reserve more parts of city streets for buses and bicycles, and set up designated pull-over spots for ride-hailing services. Those steps, detailed by city officials Monday, are part of a broad new transportation strategy that will be included in Mayor Martin J. Walsh’s budget request for the next fiscal year. But in a city notorious for traffic congestion, most of the measures focus not on managing cars, but on alternatives such as improving biking and walking routes and speeding up buses on city streets. Walsh officials said the plan, which will also include traffic signal improvements, should ease congestion by making it easier for more people to use buses, bikes, and sidewalks. The crux of the plan is a major increase in fines for parking violations, such as for double parking. The fine increase would have the dual effect of discouraging practices that can worsen traffic, while raising $5 million to fund transportation initiatives. If approved by the City Council, the parking fines and other changes would go into effect in the fiscal year beginning July 1. The administration plans to hire nearly 20 staffers for the city’s Transportation Department. One would be a transit coordinator, to work closely with the state-run Massachusetts Bay Transportation Authority on improvements such as more bus-only lanes or signal technology that would allow buses to move through traffic faster. Four additional staffers would manage the bus lanes on a day-to-day basis. Boston is planning to test its first dedicated bus lane in a decade this spring along Washington Street in Roslindale, by eliminating parking spaces in the inbound lane during the morning rush hour. A two-day trial last year made it clear the city needs more people to manage the bus lanes, said Boston Transportation Commissioner Gina Fiandaca. Chris Dempsey, who leads the advocacy group Transportation for Massachusetts, praised the plan to hire a transit coordinator. He recently visited Seattle, which has a city employee working closely on transit issues with the county government. “In Seattle, the employees really felt that even though they didn’t operate the buses they had the responsibility for the buses operating faster on their streets,” he said. Another new position would include developing designated pick-up and drop-off spots for ride-hailing companies in busy parts of the city. City officials have said this might cut down on the number of vehicles blocking traffic, though it would not directly address the sheer volume of ride-hailing cars adding to the city’s congestion. Motorists would see some benefit, such as $2 million for road resurfacing and improvements to the city’s 800 traffic signals. Two planners would be hired to help redesign the city’s intersections to make them safer for pedestrians, and the city would boost funding for biking and pedestrian infrastructure. Last year, Walsh released “Go Boston 2030,” a master plan that outlined dozens of transportation priorities, many of which centered on public transit, cycling, and walking improvements to reduce car congestion. But he was slow to put the plan into action, critics have said. And the mayor himself has fueled criticism; he once declared himself “a car guy,” upset cyclists when he said they share blame for accidents with drivers, and expressed skepticism on the efficacy of bus lanes. Osgood, however, said the new budget measures shows Go Boston 2030 is moving from ideas to implementation. Some car owners will probably feel Walsh’s new measures in the pocketbook. 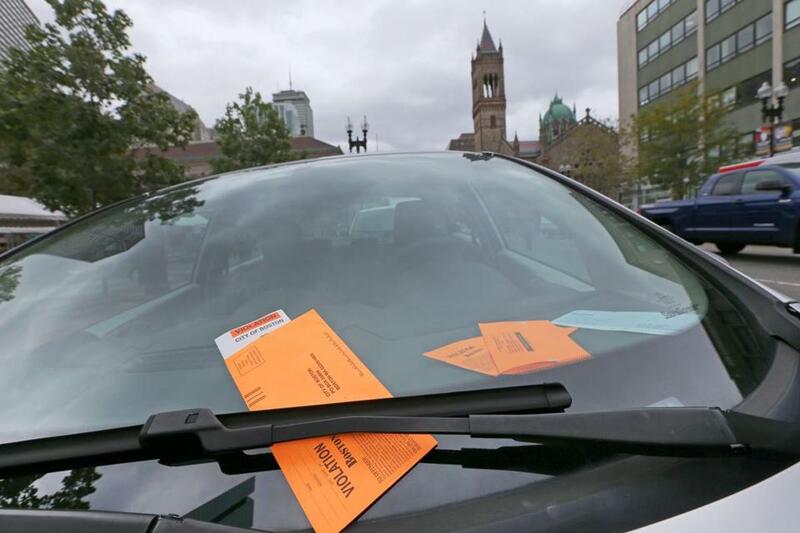 Boston would seek to hire a new supervisor to beef up parking enforcement and increase parking fines for the first time in a decade. Osgood said the increases would be for 11 types of violations that residents complain about most. The penalty for double parking in downtown neighborhoods would increase from $45 to $75; parking during street cleaning would yield a $90 fine, more than double the current $40 cost; parking in a resident-only spot without a sticker would rise to $60, from $40; while overstaying a meter would shoot to $40, from $25. The $5 million spending initiative and the increased parking fines will both require approval from the City Council. Andrea Campbell, the president of the council, said she would review the plan but had not yet seen it. Councilor Michelle Wu said it had her support.